Papers: ca. 1668-1862, 35 linear feet. The papers of John Jay include letters, manuscripts, documents, and letterbooks of John Jay and of many members of his family. The letters touch on every aspect of American life and government of the period, and contain correspondence. There are approximately 2,500 letters from John Jay, primarily drafts of correspondence, as well as his correspondence as Secretary of Foreign Affairs, 1784-1789. The manuscripts and documents include many reports, commissions, and diplomas, as well as a draft copy of The Federalist Number 5 and John Jays oath of office as Chief Justice of the United States Supreme Court; also included are manumission documents, and a group of documents (1715-1785) from Trinity Church, where his father was a vestryman. The collection includes copies of many letters; and a copy of the pair of silverplated candlesticks from the Treaty of Paris, 3 Sept. 1783, reproduced by the Smithsonian Institution. A photocopy of a letter from John Jay, Office of Foreign Affairs, to Thomas Barclay, U.S. Commissioner, written on October 5, 1787. In the letter, John Jay commends Thomas Barclay on the negotiations. Papers: Papers, 1779-1798, 25 items. Collection is made up mostly of circulars sent by Jay, as Secretary of Foreign Affairs, to the Governor of Connecticut. Papers: In the papers of Silas Deane, 1740-1842, 7 linear feet. Persons represented include John Jay. Papers: In the papers of John Francis Hamtramck, 1757-1862, 2,630 items. Papers: Papers, 1765, 1789, 2 items. Collection includes a personal letter by Jay, 1765, and letter of introduction to Jay for John Churchman, a scientist, 1789. Papers: In the papers of David Gelston, 1777-1826, .2 cubic foot. A letter from John Jay to Reverend Dr. Jedidiah Morse thanking him for a sermon, declining a place on the American Board of Commissioners for foreign missions, requesting two sets of the Panoplist, and regretting that Morse cannot undertake the writing of a history of the United States. Papers: In historical manuscripts, 1636-1935, 3 linear feet. Collection is made up of historical documents collected by Roosevelt. Persons represented include John Jay. Papers: In the papers of the Ingersoll family, 1776-1894, 82 items. Papers: Letters from the Honorable John Jay Esq. Minister Plenipotentiary from the United States of America to the Court of Spain, 1779, December 24—1782, November 14. Collection includes official correspondence from Jays time as Minister plenipotentiary with Spain. Papers: In the papers of the Jay family, 1770-1952, ca. 5 cubic feet. Microfilm: 1776-1794, 1 microfilm reel. The microfilm includes correspondence with John Jay. Papers: In the papers of Caleb Strong, 1657-1818, 2 volumes. Correspondents include John Jay. On microfilm, 1 reel. Papers: In the papers of Charles Thomson, 1765-1888, 360 items, 4 containers, 1 microfilm reel. Papers: In the papers of the Custis-Lee family, 1700-ca. 1928, 1.8 linear feet. Microfilm: In the papers of Henry Laurens, 1747-1882, 19 microfilm reels. Correspondents include John Jay. Microfilm of originals in the South Carolina Historical Society (Charleston). Microfilm: In the papers of John Sullivan, 1775-1781, 99 items, 1 microfilm reel. Papers: In the papers of John Trumbull, 1786-1841, 300 items. Papers: In the papers of Meshech Weare, 1776-1785, 2 volumes, 1 folder. Microfilm: In the papers of Joshua Johnson, 1785-1788, 1 volume, 2 microfilm reels. Microfilm: In the papers of William Heath, 1774-1872, 46 microfilm reels. Correspondents include John Jay. Microfilm of originals in the Massachusetts Historical Society (Boston). Papers: In the Maryland State papers, 1796-1821, 1775-1821, 2.5 cubic feet. Papers: In the papers of Lewis Morgan, 1777-1839, .5 cubic foot. Collection includes letters concerning financial and political matters from John Jay. A note from John Jay to Gerard Banker and Dan Hale written on November 2, 1778, and June 28. A letter from John Jay to James Monroe written on February 19, 1795. The letter concerns the Jay Treaty with England. A letter from John Jay to Thomas Jefferson written on July 7, 1795. Papers: In the papers of the Jay family, 1779-1828, 1 cubic foot. The collection is composed of many letters from John Jay concerning personal family matters and business and real estate issues, 1779-1816. Many letters are from John Jay to his nephew, Peter Jay Monro. Papers: In the papers of John Witherspoon, 1766-1784, 32 items. The papers of John Jay include contracts, receipts, and architectural drawings for construction work performed on the Jay family estate in Bedford, Westchester County, New York, as well as a three page manuscript concerning the history of Bedford prepared by John Jay as an entry for a New York State gazetteer. Receipts record payment for labor and materials for the construction of windows, doors, a piazza, kitchen, etc., at the Bedford family estate, known today as the John Jay Homestead State Historic Site. Sketches include a basic floorplan for the house at Bedford and a gate to be commissioned for construction. Also included is a holograph manuscript draft of Federalist #64, ca. 1788. Papers: In the papers of the Goodue family, ca. 1622-1895, 5 cubic feet. Papers: In the Province of New York Customs House receipts and accounts, 1704-1787, 80 items. Collection includes a manuscript copy by John Jay of the Second Federalist Paper (1787). Papers include artwork, accounts, agreements, appraisements of the farm and livestock, contracts, correspondence, deeds, diaries, indentures, inventories and lists, maps of the Jay farm and vicinty, memorabilia, notes, payments and bills, plans of the Jay house, receipts, speeches, and wills. A note from John Jay to Governor Patrick Henry of Virginia enclosing a copy of an Act of Congress concerning measures for the defense of the South [copy not included]. A letter from John Jay to a group of gentlemen written on January 15, 1796, restating the fact that the funds granted by the Act respecting infectious Distempers were insufficient to deal with the large amount of sickness in New York City. 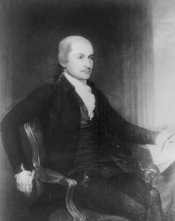 John Jay also states that precautions were taken in Albany to prevent its introduction there, and these incurred expenses which were never provided for. John Jay further writes that he encloses two letters from the mayor of Albany, his reply, and accounts mentioned. A letter from John Jay to John Trumbull written on October 27, 1797. In the letter, John Jay comments on the selection of Albany as the Capital Of New York State and other state and national political issues: I am settled here with my family at least for the winterthe Legislature have determined that this place shall be the seat of government, and the principle public offices shall be here. ... As to Politicswe are in a better state than we were, but are not yet in a sound state. ... Whether pease in Europe would ensure pease in America, is a question on which doubts are entertained. restricted: stored in the vault; Viewing the original item requires making special arrangements through Manuscripts and Special Collections. A letter from Governor John Jay to John V. Henry, Comptroller of the State of New York, written on April 30, 1800. In the letter, John Jay writes regarding the request by the Commissioners of the Health Office for money and states that part of their request may not be provided for by law. John Jay further suggests that John Henry go to the Attorney General, and asks John Henry to direct the Treasurer to pay them a part of the sum they request. Microfilm: In the papers of Alexander Hamilton, 1757-1804, 46 reels. Correspondents include John Jay. Microfilm of originals in Library of Congress. Papers: Report on the necessity of consuls, 1785 September 19. Report submitted to Congress by John Jay outlining the necessity for consuls in several foreign cities and proposing different ways to establish them. Papers: In the papers of John Cooley, 1783-1822, 42 items. Collection includes letter by John Jay. Papers: In the papers of the Jay family, 1759-1895, ca. 25 items. Letter writers include John Jay. Papers: In the Egbert Benson collection, 1786-1819, 10 items. Collection includes one incoming item from John Jay. A letter from John Jay, Secretary of Foreign Affairs, informing the Governor of Massachusetts that the Congress has recognized Richard Soderstrom as Consul from Sweden in Boston. A letter from John Jay to his son, Peter, concerning a sum of money owed by Mr. Bailey. There is also reference made to the Kenney affair and family matters. A letter from John Jay to Peter Augustus Jay concerning Caesars situation. The letter also documents Peter Jays partnership with Mr. Munro. The papers include two letters from John Jay to Sieur de la Forest written on January 7, 1786. In the letter, John Jay confirms Sieur de la Forests appointment as Vice-Consul General of the Kingdom of France to the United States. Another letter from John Jay to George Fox, Secretary of the Society for Political Enquiries, was written on August 28, 1787. Papers: In the manuscript collection, 1731-1970, ca. 40 cubic feet. Collection includes letter of John Jay to his wife mentioning treaty signed in London, 1794. Papers: 1777, 0.1 cubic foot. A letter from John Jay to his wife, Sarah, expressing his concern for her safety during the Revolutionary War. Papers: In the papers of the Jay family, ca. 1772-1901, 2.25 linear feet. John Jay is represented in the papers by nine letters beginning in 1801 at the time of his retirement. These chiefly discuss his health and family matters. Microfilm: Foreign letters of the Continental Congress and the Department of State, 1785-1790, 1 reel. The records consist of instructions sent to U.S. ministers and consuls abroad by John Jay. Microfilm of originals in the National Archives.